Wendell Odom, CCIE No. 1624 (Emeritus), has been in the networking industry since 1981. He has worked as a network engineer, consultant, systems engineer, instructor, and course developer; he currently works writing and creating certification study tools. 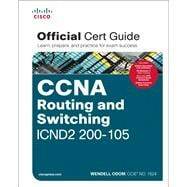 This book is his 27th edition of some product for Pearson, and he is the author of all editions of the CCNA R&S and CCENT Cert Guides from Cisco Press. He has written books about topics from networking basics, certification guides throughout the years for CCENT, CCNA R&S, CCNA DC, CCNP ROUTE, CCNP QoS, and CCIE R&S. He helped develop the popular Pearson Network Simulator. He maintains study tools, links to his blogs, and other resources at www.certskills.com.